A few tips how to do style your bathroom according to the Feng Shui. This is the second room (beside for kitchen), where the dominant element is water, so the bathroom is also related to the family finances. Once you have put in order the kitchen and found there a favorable flow of energy, it's time to do the same thing in the bathroom. Bathr oom is better to be placed in the east, which contributes to the desires, or in the north-east, which is making benefit to your communication. Bathrooms in the northern part of the house can lead to the excessive influence of water, especially when the kitchen is also located in the north. Other sectors of the house are also less favorable for the bathroom. Still, if the bathroom is located in the northern part of the house, you should weaken the force of water through various shades of brown and yellow colors and avoid excessive water symbolism, reducing the number of blue and black. To establish the necessary balance between the elements, it will be enough to use only a small number of the appropriate color or just a few plants. Similarly, we can establish a balance of elements, if the bathroom is located in the other - unfavorable - parts of the house. The same principles should guide the placement of equipment in the bathroom. For example, if a sink or a tub is located in the northern part of it, it is possible to reduce the influence of water by plants or other symbols of the tree. The bathroom does not have to be very large, but darkness and a lack of space in a similar way will affect your finances. 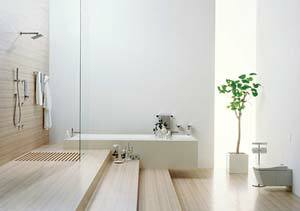 To create a sense of space in the bathroom, you will need mirrors and a lot of light. Bathroom needs such a symbol of wealth and prosperity, as a circle, so if it is possible, you may install an oval or circular bathtub. Mirrors, shelves and other items must also be circular in shape. Water is associated with wealth, as well as with the flow of "Qi" energy, and - as long as we always let down the toilet water, which is carried away - then in terms of Feng Shui, this means that the toilets require our special attention. No matter in which part of the house is placed the toilet, some properties of this sector, if there are not performed the necessary manipulations, can be carried away too. Therefore, the best position for the toilet - that side of the house, which is the least favorable for the head of the family, and also such a place, where there is an excess of "Qi" energy, and therefore a decrease will finally bring only a benefit. If there is no such a sector in the house, then you must restore the energy balance using a crystal or a large stone, or a constant flow of the positive energy will lead at the south to a bad reputation, in the north - to the lack of professional development, in the east - to a bad health, in the west - to a lack of fun and romance, in the north-east - a lack of commitment, on the north-west - a lack of responsibility, in the south-east - to the money problems, and on the south-west - to the fragile marriage. If the toilet can be separated from the bathroom, it will help to reduce the destructive impact to a minimum. Cover of the toilet should always be down, and the toilet door should always be closed, especially if the toilet is located beside the front door or bedroom door, otherwise it will adversely affect the entering of the "Qi" energy and it's movement in the direction of the main rooms. In this case, the outside part of the toilet door should be decorated with a mirror that will reflect the "Qi" energy. Similarly, this should be done if the toilet is located in any other unfavorable place of the house. Toilets greatly increase the influence of the "Yin" energy in the environment, therefore, to restore the balance, it may be necessary to confront them with the symbols of the "Yang" energy. In the toilet, regardless of it's location, you need a good ventilation, because it provides a favorable movement of the "Qi" energy, it is reasonable to have there a small window or a vent.